The global wind energy sector has matured into an affordable electricity supply option helping to reduce both air pollution and greenhouse gas emissions, leading many electricity systems to consider the re-powering of wind turbines to capitalize on efficiencies and economic gains. One of the recommendations in CanWEA’s submission to Ontario’s Long Term Energy Plan (LTEP) process addresses re-powering. There are a number of ways to re-power wind generation. Older turbines can be replaced at end of life with new, larger and more efficient turbines, resulting in considerably more electricity production and more affordable power from a smaller number of turbines. Newer turbines can be re-powered by retrofitting them with state-of-the-art nacelles, rotors, power electronics and controls at a lower cost than full replacement of the turbine. The result would be improved power generation, increased reliability and better adaptation to local site conditions – improving economics for both the turbine owner and electricity customers. The Canadian Wind Energy Association (CanWEA) would like to see the LTEP enable opportunities to optimize the efficiency of our existing wind generation facilities through re-powering or ‘uprating’ while still under contract. We also recommend that the LTEP clarify its support for re-powering existing generation as contracts expire, to maintain supply reliability. As discussed in our LTEP submission, the province’s Ontario Planning Outlook is not clear on the mechanisms that may be required or developed to ensure that electricity generation adequacy is maintained over the next 20 years. Our analysis, provided to the province, clearly shows that there is considerable risk that power demands could be higher than expected. There is also a major risk of greenhouse gas emission increases when the Pickering nuclear station is retired and other nuclear units are shut down for refurbishment. In addition, there is no clear process or transparent market mechanism for re-powering or maintaining operation of expired generation to meet future demand increases. Ontario’s Independent Electricity System Operator has not decided whether contracting for long-term power supplies will continue or whether all new supply will be subject to a capacity auction. The problem is that some generation projects – such as wind farms – will not flourish within a capacity market. They require financeable contracts to proceed. For those generators that decide to remain in service, the risk to revenue may lead them to demand higher market revenue, seeking shorter payback for operational investments. This could result in higher prices. 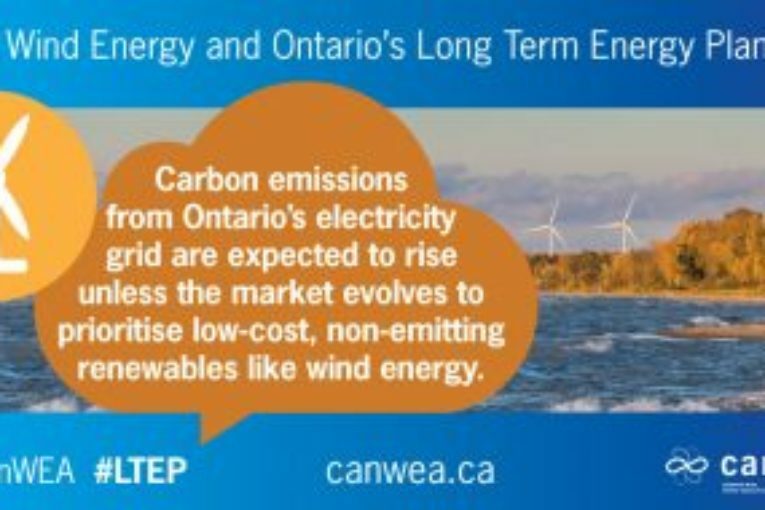 Since there is no clear process or transparent market mechanism for re-powering or maintaining the operation of generation reaching the end of its life, CanWEA strongly recommends that the updated LTEP employs competitive contracting to provide revenue certainty for wind generators and affordable prices for electricity customers. This would clearly be in the best interests of Ontario. It would help ensure that the province continues to reap the benefits of an important new industry that it has built up from the ground up – one that is now becoming the lowest-cost option for new electricity generation, an essential contributor to the province’s Climate Change Action Plan, and a key hedge against risks to the province’s power supply reliability over the coming decades.